The Geothermal Resources Council backs the plan to restore the inland sea using revenue from new geothermal energy development. The Imperial Valley has the largest confirmed geothermal reservoirs in the USA. These reserves are generally considered by geothermal experts to be between 1500 MW and 2500 MWs. 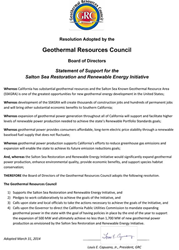 The Geothermal Resources Council (GRC) today joined with other influential groups in endorsing the Salton Sea Restoration and Renewable Energy Initiative. Steve Ponder, GRC Executive Director, delivered a resolution backing the initiative, to the Senate Select Committee for California’s Energy Independence and Assembly Select Committee of the Renewable Energy Economy in Rural California at a joint informational hearing for legislators at the California State Capitol in Sacramento. Enhancing environmental quality and supporting species habitat conservation.